Background: The correlation of intra-operative frozen section diagnosis with final diagnosis on permanent sections is an integral part of quality assurance in surgical pathology laboratories. However, there is scant data on this topic from Pakistan. Similarly, no local study has looked at frozen section turnaround times. Aims and Objectives: To analyze indications, discrepancies and deferrals for all frozen sections performed or received at our institution over a 1-year period and to determine the turnaround time for frozen section diagnoses in our cases. Design: A retrospective study, was undertaken, of all frozen sections reported at our institution between 1 st January 2006 and 31 st December 2006. The records of these cases were reviewed. The number and types of discrepancies, including sampling and interpretation errors were determined. The deferred cases and causes for deferral were also determined. The turnaround times of all cases were recorded. Agreement rates were calculated as percent agreement, sensitivity/specificity and positive and negative predictive values. Results: A total of 356 specimens were received. Out of these, 14 cases (3.93%) were deferred to permanent sections. Of the remaining 342 cases, the discordant diagnostic frequency was 2.92% while the concordant diagnostic frequency was 97.08%. The most common pathological processes encountered were presence/typing of neoplasm (51.12%) and assessment of surgical margins (27.53%). The average turn-around time for frozen section diagnosis was 23 minutes; 60% of the cases were reported in 20 minutes or less. Conclusions: The accuracy of frozen section diagnosis at AKUH pathology department can be interpreted as comparable with most international quality control statistics for frozen sections. The overall error and deferral rates are within the range of previously published errors in pathology. Deferrals and errors in some sub-specialties were higher than in others. The results suggest specific measures should be taken to reduce the number of discrepancies. The overall goal is to reduce errors, reduce the number of deferrals and improve frozen section diagnosis turnaround times. 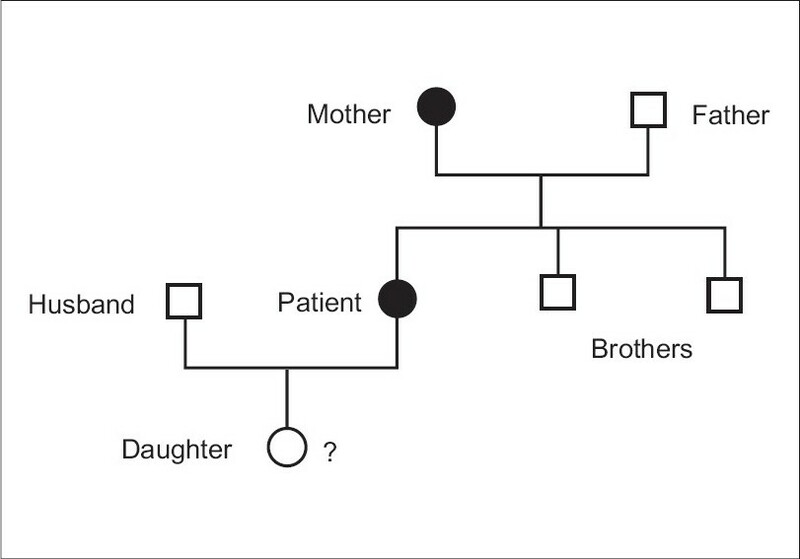 Objective: Congenital myopathies are rare. Through this article, the authors want to present a clinicopathological analysis of 25 new cases. Materials and methods: The clinical data of patients who were diagnosed with congenital myopathy between 2001 and 2006 was retrieved. Muscle biopsies were processed for H&E staining, enzyme histochemistry, and immunohistochemistry. 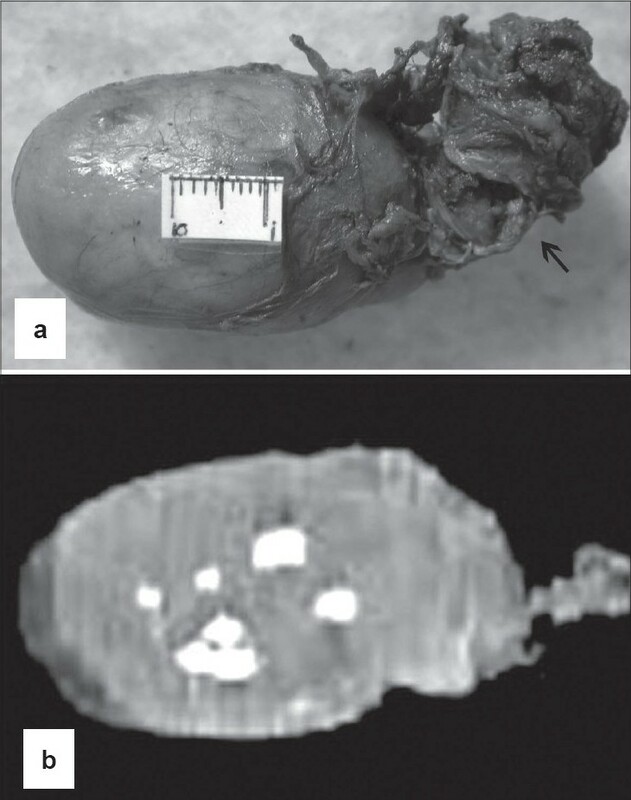 Biopsies were also processed for ultrastructural analysis. Results: During a period of 6 years, 1.12% of the muscle biopsies were diagnosed as congenital myopathies. The most common congenital myopathy was central core disease followed by nemaline rod myopathy and multi-mini core disease. Clinically, they have variable features. 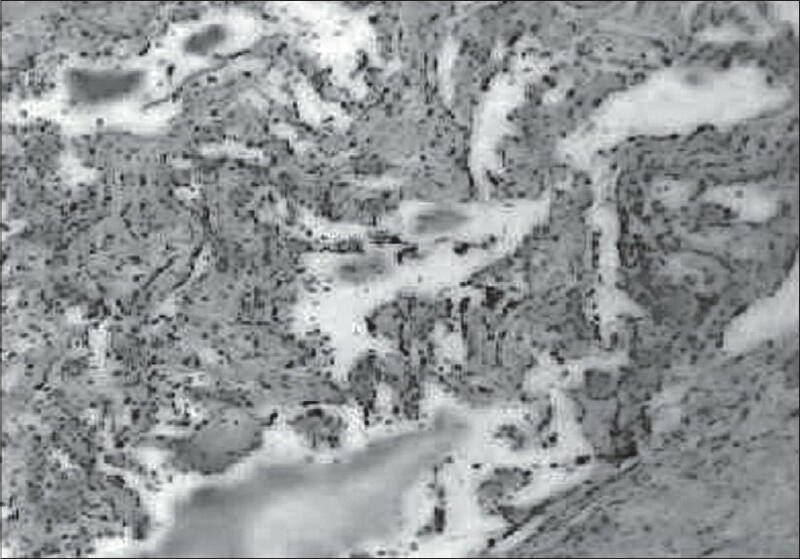 The final diagnosis was made with the help of enzyme histochemistry and ultrastructural features. Conclusion: This study emphasizes the importance of enzyme histochemistry and electron microscopic examination in the diagnosis of congenital myopathies especially in the absence of genetic studies. Thirty-six human immunodeficiency virus (HIV)-positive patients with lymphadenopathy were subjected to fine-needle aspiration cytology (FNAC) over a period of 2 years. The maximum number of cases was reported in the age group of 21 to 30 years. Majority of the patients were males. The maximum number of cases had tuberculosis (58.3%) followed by reactive lymphadenitis (36.1%), non-Hodgkin's lymphoma (2.7%) and acute suppurative lymphadenitis (2.7%). FNAC is an important diagnostic tool in the evaluation of lymphadenopathy in HIV-positive patients. Malignant melanoma is a tumor of melanocytic origin. Lymphatic and hematogenous metastases are common in this condition. Retrospective analysis was performed in 16 consecutive cases diagnosed histopathologically as malignant melanoma at the pathology department of a medial college in eastern India. 75% of the patients were male; majority of them was in their sixth decade. All (100%) the lesions were pigmented. The primary site was known in all cases, except two (12.5%). Out of the 14 cases with known primary site 11 (78.57%) were cutaneous melanomas, including one arising in labia minora, two (14.29%) were ocular and one (7.14%) was vaginal in origin. Among cutaneous melanomas, superficial spreading type was the commonest variety and mixed population of epithelioid and spindle cell was the commonest histopathological pattern. The commonest grade of invasion was grade III (Clark's). The clinical presentation of the case of vaginal melanoma and the two cases of secondary melanomas, including the one with obscure primary tumor, were bewildering and hence are discussed separately. Neoplasms of upper gastrointestinal tract, especially malignancy, are one of the leading causes of death worldwide. The advent of endoscopy has greatly facilitated the detection and diagnosis of gastrointestinal lesions. Although it has been shown that the combined use of cytology and biopsy renders the highest probability of detecting malignancy, the merit of routine brush cytology has been questioned since it appears to duplicate biopsy. 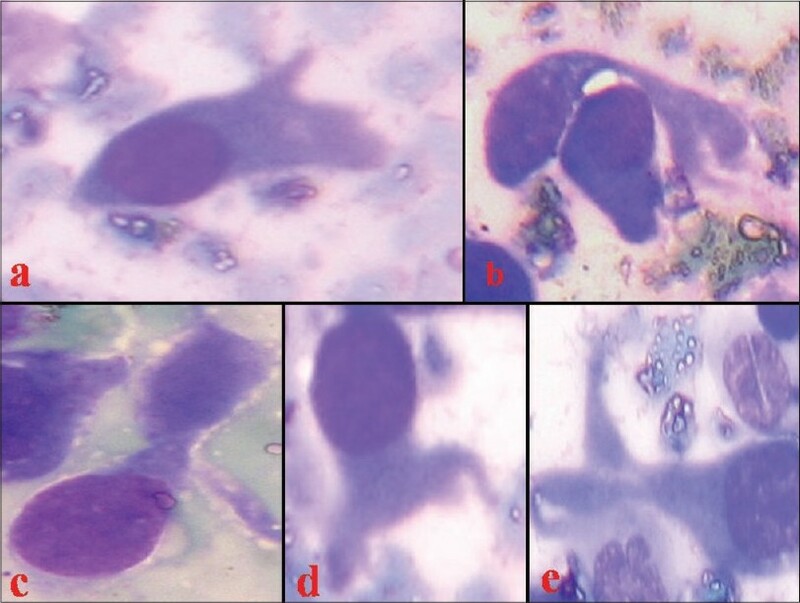 This study is undertaken to correlate the findings of brush cytology with tissue biopsy and the feasibility of the procedure as an adjunct in diagnosis of upper gastrointestinal tract neoplasms. Seventy-five patients with upper gastrointestinal tract symptoms were subjected to endoscopy in a period of two years. Brushing was done before the biopsy was taken from the suspected lesions and cytological findings were compared with that of biopsy. Of the 75 cases, brush cytology was positive for malignancy in 65 cases (86.66%) and biopsy was positive in 58 cases (77.33%); the sensitivity of the study was 98.03%. Thus, brush cytology is a useful adjunct to biopsy in the diagnosis of upper gastrointestinal tract malignancy. With the inclusion of a "suspicious" category in the reporting of the smears, malignancy can be detected early, and if possible, patient management can be altered. Extended spectrum β-lactamase enzymes (ESBLs) are enzymes that have the ability to hydrolyze oxyiminocephalosporins and infections by isolates producing them are often difficult to treat. A study to detect the presence of these enzymes in isolates was conducted by our hospital. A total of 207 non repetitive isolates were screened for resistance to any of five screening agents. Those with suspicious profiles were checked for ESBL production by double-disk approximation or a synergy test. The isolates were also subjected to a phenotypic confirmation test as recommended by CLSI (formerly NCCLS). Various cephalosporins-β-lactamase inhibitor combinations were also tested. Of the 204 (98.5%) screen-positive isolates, only 126 (61.7%) were identified as ESBL producers. Of these, 26.1% of the isolates were positive by using the double-disk synergy test (DDST) method alone, 13.4% were positive using the method recommended by CLSI, and 60.3% of the isolates were positive by both the DDST and CLSI methods. We also report a high percentage of resistance to cefoxitin (96.8%) indicating changes in porins. The pelvic cavity is a basin-like space in the lowermost part of the abdomen where various neoplastic and non neoplastic lesions can occur involving its contents. When the nature of lesions are not clearly gynecological, patients are managed by surgeons. Our study aims to asses the clinicopathologic analysis of neoplastic lesions of the pelvic cavity managed by surgeons particularly over a period of 2 years. Out of 162 total lesions, 102 cases were non neoplastic, such as appendicular lump, Tubo-ovarian (TO) mass, hematoma and 60 cases were neoplastic. Among the 60 cases of neoplastic lesions, 40 cases were benign comprised of twisted ovarian cyst, broad-ligament fibroid, and neurofibroma and 20 cases were malignant comprised of colorectal carcinoma, ovarian carcinoma, liposarcoma, Primitive nurectodermal tumor (PNET), seminoma, and lymphnode metastasis. The lesions in such closed, difficult to approach areas throws clinicians into a diagnostic dilemma during both the preoperative and intraoperative period. Even pathologists cannot ascertain some diagnosis without the help of immunohistochemistry. So, to adopt early and concise management protocol, there should be more such studies in different institutions that are currently lacking in world literature. Xeroderma pigmentosum (XP) is a rare, autosomal recessive disorder characterized by photosensitivity, cutaneous pigmentary changes, premature skin ageing and development of various cutaneous and internal malignancies at an early age as a result of a defect in nucleotide excision repair following ultraviolet light exposure. Cutaneous angiosarcomas are aggressive neoplasms that are rarely associated with XP. In this communication, we report the case of a 40-year-old male patient with XP who developed an angiosarcoma of the face and discuss the implications of this association in view of recent developments in this field. Signet ring cell adenoma of the thyroid, though rare, is well documented. This change is chiefly due to intracellular accumulation of thyroglobulin that appears mucinous. Awareness of this entity is important as it may closely simulate a metastatic mucin-secreting signet ring cell carcinoma. Although the mucinous material in signet ring cells has been reported to stain positive with thyroglobulin, in some cases it may not be so. 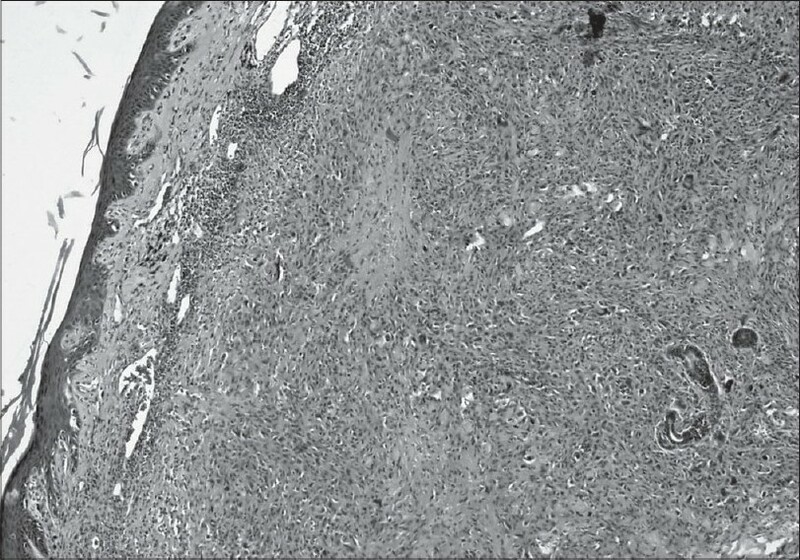 We herein describe a rare case of a 46-year-old man who was hypothyroid and the mass removed from the thyroid showed a mucin-producing signet ring cell adenoma of the thyroid. 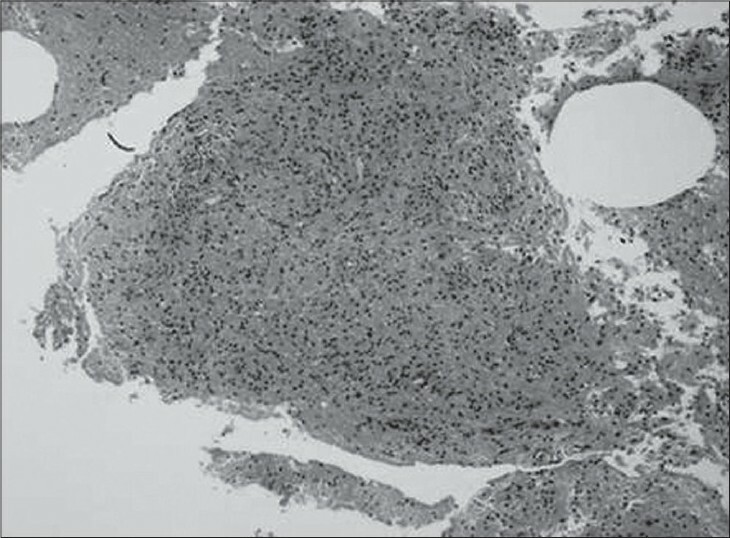 Collapsing glomerulopathy (CG) is a distinct clinicopathological entity characterized by high levels of nephrotic range proteinuria, rapidly progressive renal failure, marked parenchymal injury, and poor response to present therapeutic regimens. Growing awareness has led to the identification of associated conditions other than human immunodeficiency virus (HIV) and idiopathic. 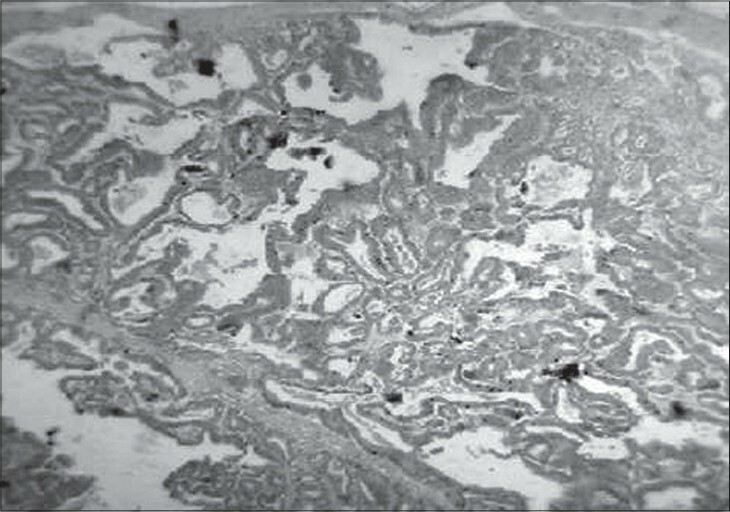 We report a case of CG from India in a HIV-negative young female, presenting with heavy proteinuria and rapidly progressing renal failure preceded by a febrile illness. 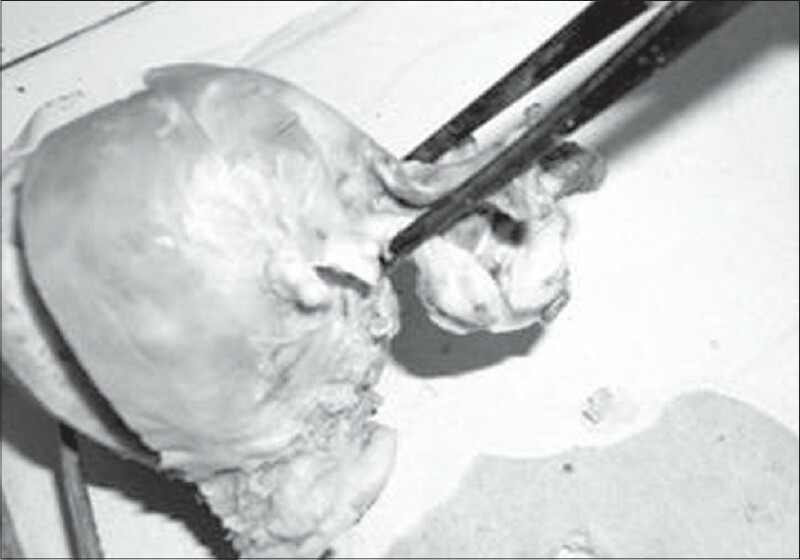 This case report describes the precursor lesion of uterine papillary serous carcinoma (UPSC). 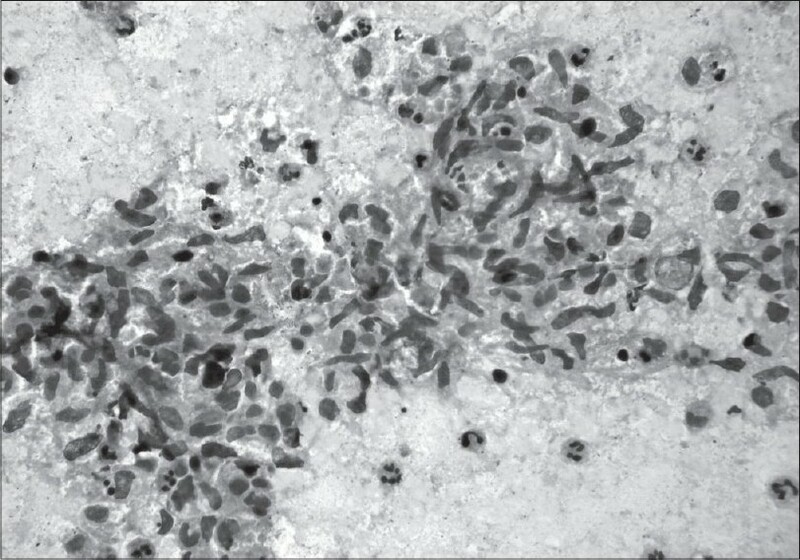 A 65-year-old post-menopausal female presented with prolapse and vaginal discharge and underwent a hysterectomy revealing an atrophic endometrium, highly atypical endometrial glands, the lining cells of which showed pseudostratification, hobnailing, a high nuclear to cytoplasmic ratio, and prominent nucleoli. 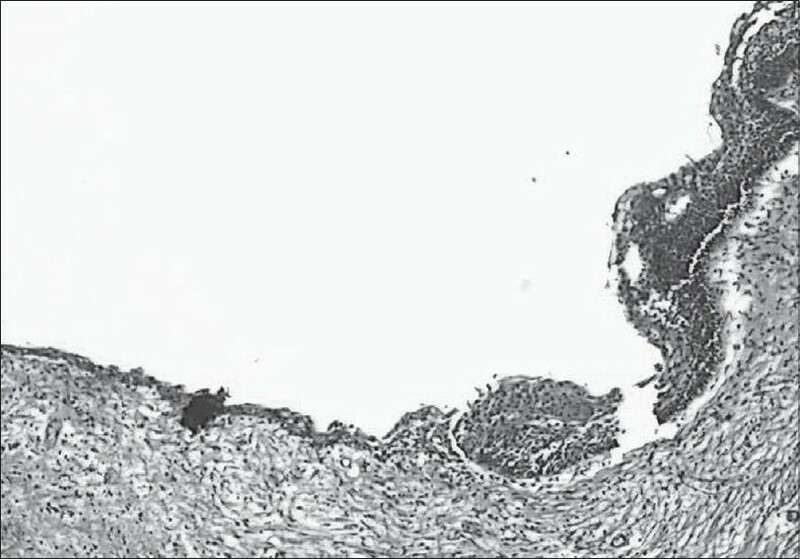 A p53 immunoreactivity score of 8 and a MIB-1 index of 80% was obtained leading to a diagnosis of endometrial intraepithelial carcinoma (EIC). 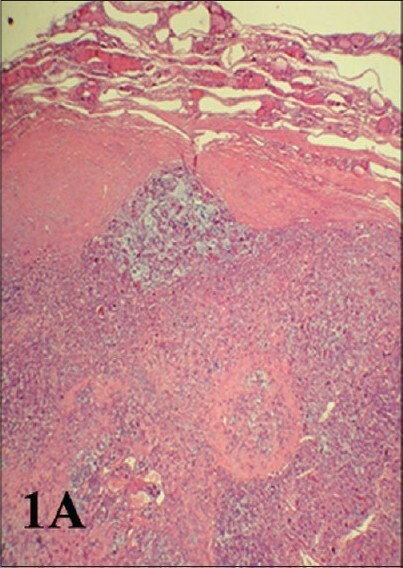 Since serous EIC is commonly associated with extra-uterine serous carcinoma, it is a uniquely aggressive precursor lesion. Molecular studies support the hypothesis that EIC is a precursor of both uterine and extra-uterine invasive serous carcinomas. This is why the treatment protocol for EIC cases is total abdominal hysterectomy (TAH), accompanied by a staging procedure. In our patient, EIC was limited to the endometrium; associated with an excellent clinical outcome. Classification of skeletal angiomatosis into aggressive and nonaggressive types is on the basis of their clinical behavior and pattern of skeletal involvement (regional and disseminated). Gorham's disease (massive osteolysis) is an aggressive form of skeletal angiomatosis that shows regional involvement, frequently involving the shoulder and hip areas. Cystic angiomatosis is a nonaggressive form of skeletal angiomatosis with multifocal involvement, predominantly affecting the trunk bones. The imaging modalities gave the diagnosis of cystic angiomatosis of humerus showing multicystic lytic areas. 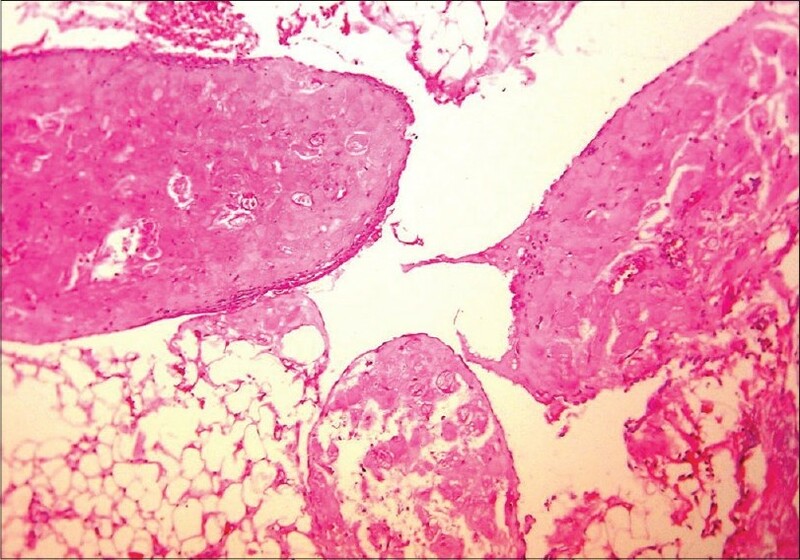 The histopathological differential diagnosis was cystic angiomatosis and Gorham's disease, as microscopically both are indistinguishable from each other. Both represent a complex network of dilated thin-walled capillaries growing in the marrow space associated with the destruction of bone and infiltration into the adjacent soft tissues. 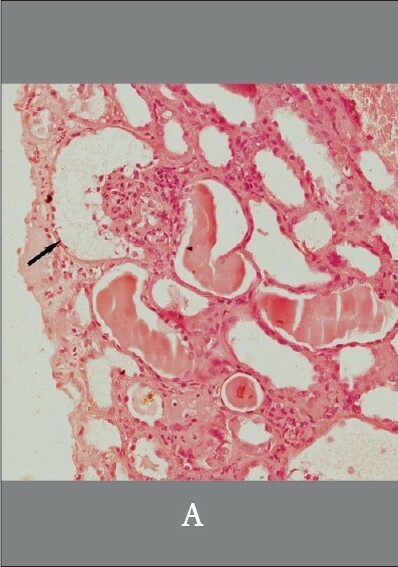 The case is presented because of its extreme rarity and due to the diagnostic dilemma, whether to label it as Gorham's disease or as cystic angiomatosis. Considering the site involved and its aggressiveness, the diagnosis is in favor of Gorham's vanishing bone disease as cystic angiomatosis is multicentric and nonaggressive, involving mostly vertebrae and skull with multicystic lytic lesions. Ectopic decidual reaction is commonly seen in the ovary and cervix; however, peritoneal localization is rare. Peritoneal deciduosis is usually an incidental histological finding. It may present a diagnostic dilemma by mimicking grossly peritoneal carcinomatosis or tubercles and deciduoid mesothelioma, microscopically. We report three cases of ectopic decidual reaction discovered incidentally during caesarian sections, as whitish yellow nodules resembling tubercles. Histology revealed extensive decidualisation. To the best of our knowledge, this is the first report of ectopic decidua mimicking peritoneal tubercles. Thyrolipoma or adenolipoma of the thyroid gland is defined as a thyroid adenoma containing mature fat tissue. It is a rare encapsulated lesion. A case of a 35-year-old female presenting with swelling in the neck that was diagnosed as adenolipoma is described because of its extreme rarity. This paper reports a case of a 42 year old female patient who presented with a large multi septate, predominantly cystic ovarian mass with elevated CA-125 levels. A diagnosis of malignant ovarian tumour was made on grounds of pre operative investigations and radical surgery was planned. Histopathological examination however revealed an ovarian fibroma with cystic change reinforcing the non specificity of CA-125 as a marker of ovarian malignancy and establishing the importance of a proper histopathological examination even in the most obvious of cases. Lipomas of the bone usually occur in the long bones and are seen in the fifth to seventh decade of life. Rib lipomas are rare and those having parosteal location are even rarer. We report a case of parosteal lipoma of the rib in a young male with some unique features. This is the fifth case of its kind to be reported in literature. 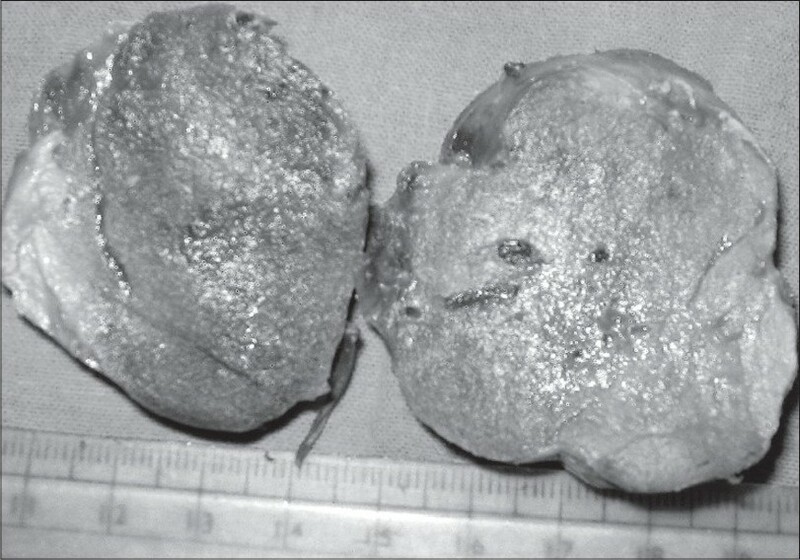 An 8-year-old female presented with an abdominal lump. A ultrasonography showed a heterogeneous, mainly solid space-occupying lesion with few cystic components and irregular margin in both adnexae measuring 10.5 x 5.2 x 3.5 cm and 9.2 x 4.8 x 3.0 cm. 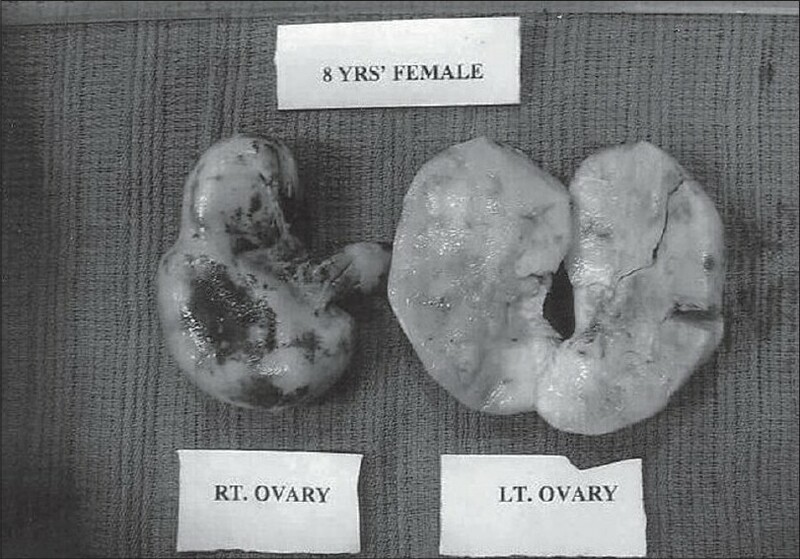 The tumors were removed by exploratory laparotomy and the histopathological report was primary NHL of the ovary. The uterus and cervix were healthy and there was no tumor extension or omental deposit. The patient was referred for chemotherapy. Adrenal oncocytoma is a rare adrenal neoplasm with only 21 cases reported in English literature. These adrenal tumors are usually nonfunctional and hence incidentally detected. Most of these adrenal neoplasms are benign. We report a rare case of adrenal oncocytoma that was functional and was successfully managed by laparoscopic adrenalectomy. Microlithiasis of the epididymis, which is not associated with epididymal inflammation, is a rare entity that has been infrequently published in the literature. We report, one such case that was incidentally detected in association with prostatic adenocarcinoma. 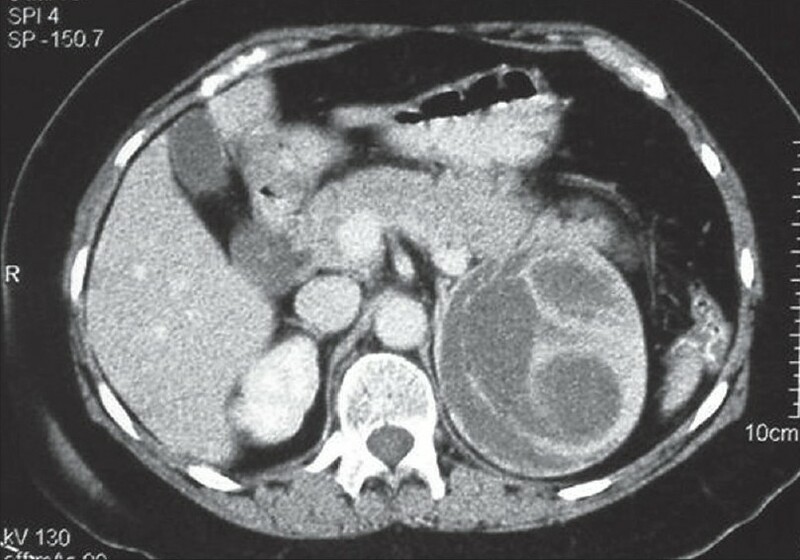 Mucinous adenocarcinoma of the renal pelvis is an extremely rare tumor with very few case reports in literature. Pseudomyxoma peritonei is an uncommon condition characterized by the presence of mucinous gelatinous material in the peritoneal cavity. It occurs secondary to primary mucinous neoplasms of particularly the appendix and the ovary. We present a case of a 35-year-old female who had a history of dull aching pain in the right flank since one and a half years. 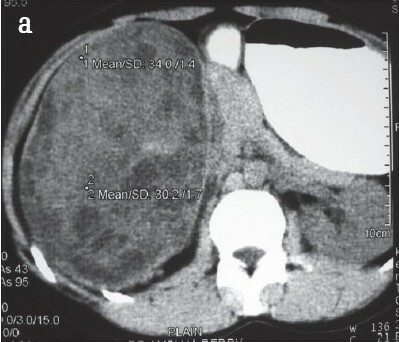 Upon ultrasonography (USG) and computerized tomography (CT) scan, there was a large cystic mass measuring 15x15x12 cm, extending into the right lumbar region. 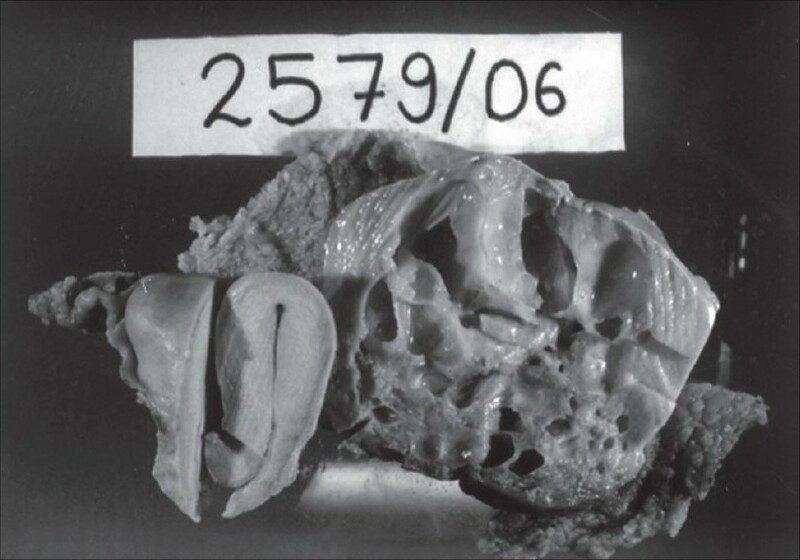 Grossly, the entire kidney was converted into a cystic mass measuring 15x15x12 cm containing gelatinous mucinous material weighing 1 kg. Histologically, the tumor was composed of simple and complex glandular acini together with a superficial resemblance to colonic mucosa with abundant extracellular mucin. Thus, a diagnosis of mucinous adenocarcinoma of the renal pelvis leading to pseudomyxoma peritonei was made. 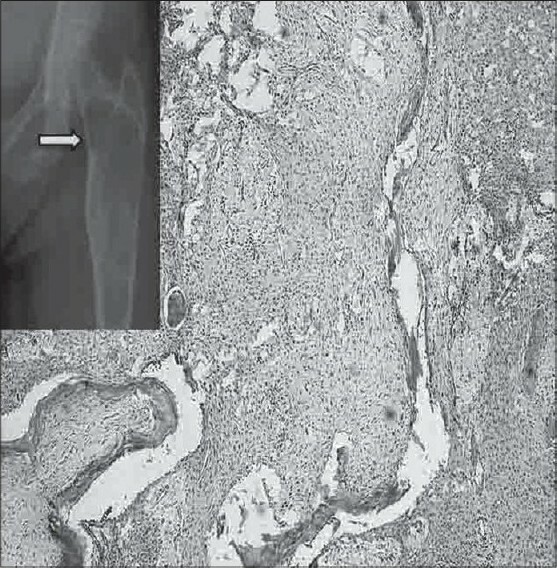 A polymorphic fibro-osseous lesion of the bone is a benign fibro-osseous lesion of the bone with a marked predilection for the proximal femur and characterized by a complex mixture of histological elements. We present one such case of a 35-year-old female with spontaneous onset of pain in the left hip for 3 months and trauma sustained a year ago. An examination revealed tenderness with painful movements over the anterior aspect of the left hip joint and trochanter. A clinico-radiological differential diagnosis of simple bone cyst or fibrous dysplasia was entertained. A microscopic examination of the lesion with clinico-radiologic correlation led to the diagnosis of a polymorphic fibro-osseous lesion. This is a genuine clinico-pathologic entity that is usually asymptomatic with a rare history of trauma or hip pain. 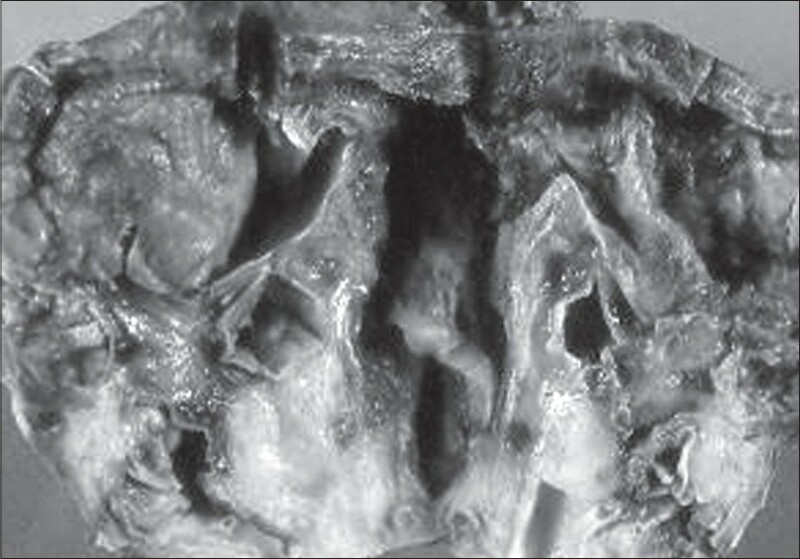 It has a distinctive histopathological picture with a better prognosis than its mimics. 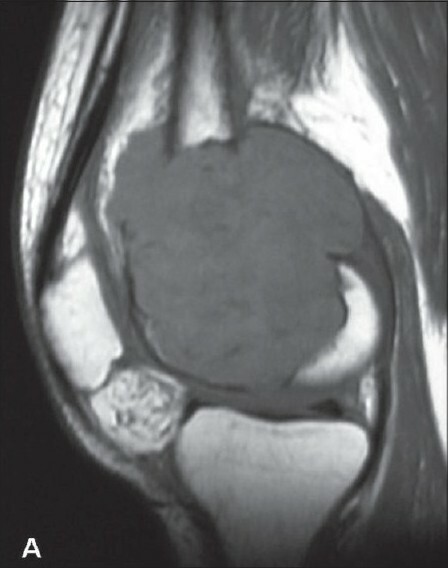 Chondroid lipoma (CL), a rare lipoma variant, has not been described well for patients younger than 14 years of age. We herein report an extremely unusual instance of CL in a 7-year-old child. 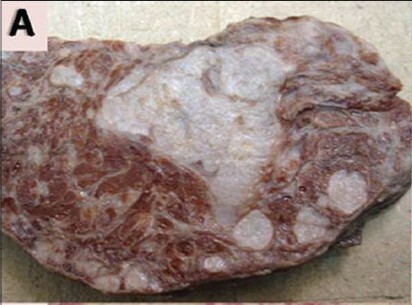 The cut surface of the tumor showed peculiar tan-brown and yellow-white areas. 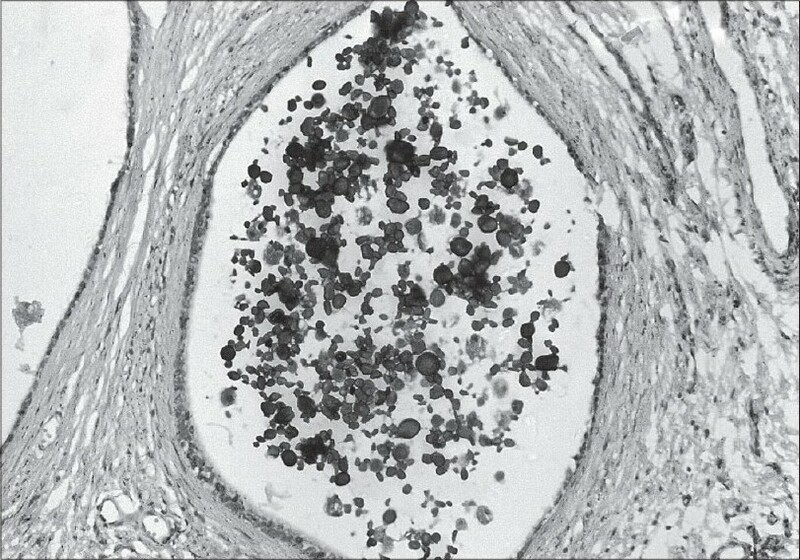 Histopathological sections showed the presence of eosinophilic variably vacuolated round- to oval-spindle cells in a myxo-hyaline background. The findings were consistent with CL. The case is reported because of its extreme rarity. A 68-year-old man was referred to us with clinical and bone marrow (BM) features compatible with aplastic anemia. The correct diagnosis, hypoplasia of the BM coexisting with multiple myeloma, became apparent after noting rouleaux in the peripheral blood (PB) and approximately 50% plasma cells in the touch imprint of one of the two BM biopsies done. As standard therapy was precluded, the patient was put on dexamethasone but died within 4 days. This first case of the coexistence of untreated myeloma with aplastic BM shows that even apparently straightforward hypoplasia seen on the BM biopsy should be interpreted in conjunction with the PB smear and the BM touch imprint findings. Among other things, the BM biopsy and imprint should be repeated if the PB has findings such as rouleaux that do not fit with straightforward aplastic anemia. The combination of myeloma and BM aplasia precludes standard therapy and is rapidly fatal. The spectrum of side-effects of sodium stibogluconate is well described, however, little is known regarding the acute erythroid toxicity caused by this drug. We hereby present a case with this unusual complication of antimonial therapy. 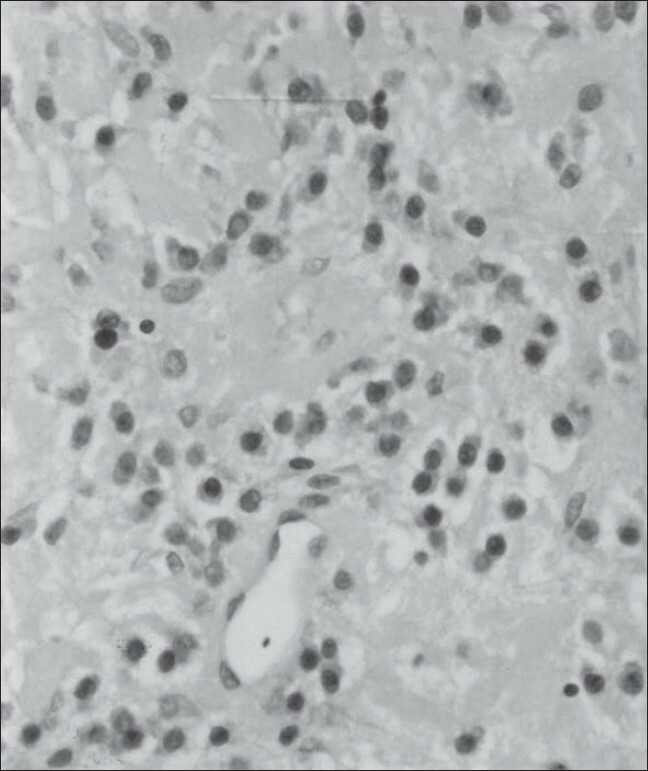 A 6-year-old male with leishmaniasis was started on parenteral sodium stibogluconate. During the course of treatment, his hemoglobin (Hb) dropped from 7.2 g/dl to 3.5 g/dl. 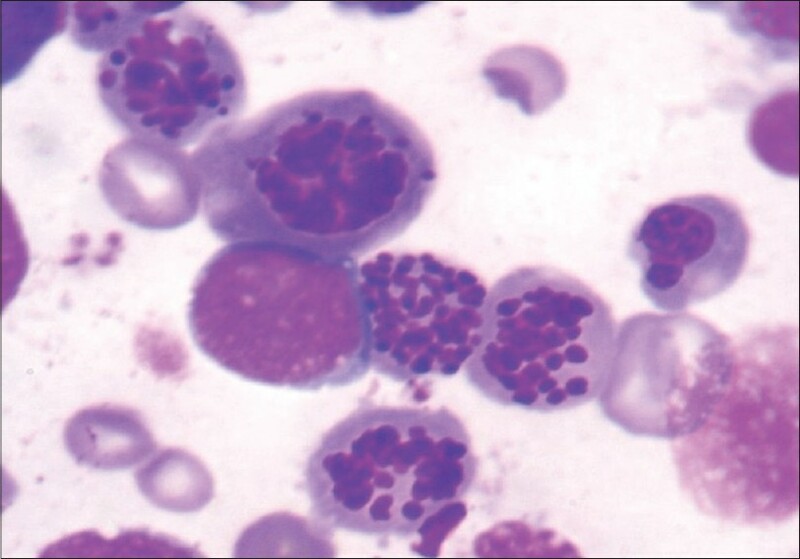 Bone-marrow aspirate showed karyorrhexis in many erythroid precursors with several Leishmania donovanii bodies. Sodium stibogluconate was stopped and amphotericin-B was started. Four days after the cessation of the antimonials, the patient's Hb improved to 5 gm/dl with a corrected reticulocyte count of 10% indicating bone-marrow erythroid regeneration. The exact mechanism of this acute erythroid toxicity of sodium stibogluconate remains unexplored. 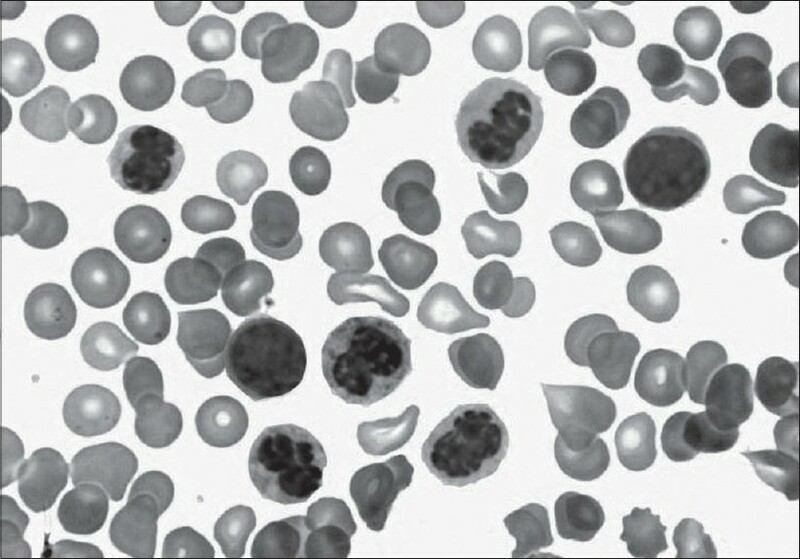 The syndrome of abnormal chromatin clumping is largely a morphological entity characterized by exaggerated chromatin clumping seen in the neutrophils. According to the recent World Health Organization (WHO) classification, it is categorized as a variant of atypical chronic myeloid leukemia (aCML) or Ph-negative CML. Most of the cases reported in literature have been negative for the Ph chromosome or the BCR-ABL gene. Till date, Ph positivity has been demonstrated in just one case. We report two more Ph-positive CML cases with abnormal chromatin clumping in neutrophils. To the best of our knowledge, this is only the second time in literature that such cases have been described. These two unusual cases go on to extend the morphological spectrum of granulocytic changes seen in Ph-positive CML. Objectives: To report a case of acute intermittent porphyria (AIP) diagnosed by chance during routine investigations. 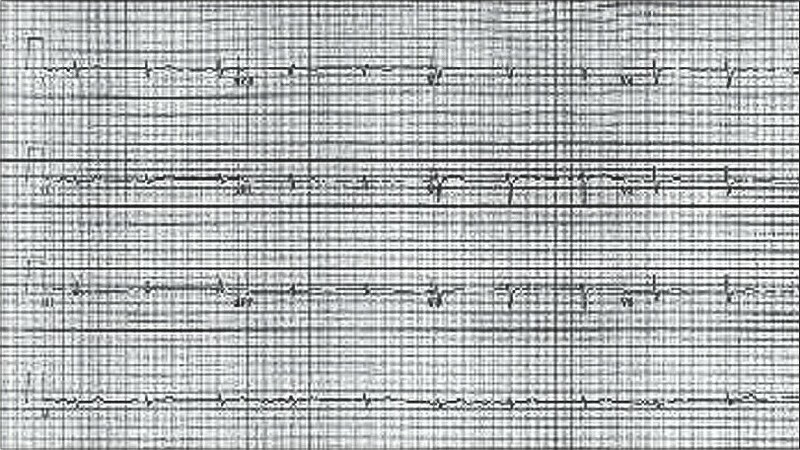 Clinical Presentation and Intervention: A 21-year-old female presented with vague gastrointestinal symptoms. Upon admission, she was disoriented. Later she developed generalized seizures and was treated with phenytoin, but the condition worsened. Upon investigation, her liver function, renal function, blood sugar level and electrolytes were within normal limits. When kept for routine laboratory testing, the color change in urine prompted us to investigate for porphyria. It was positive for phorphobilinogen (PBG) and urophorphyrin. Since AIP had been diagnosed, the initial treatment with phenytoin was discontinued with a favorable outcome. A screening test for PBG in urine by Ehrlich's reagent was performed on the patient's mother and was positive. Conclusion: A high degree of suspicion at the laboratory can also determine the diagnosis of AIP, which is often missed by the clinician. 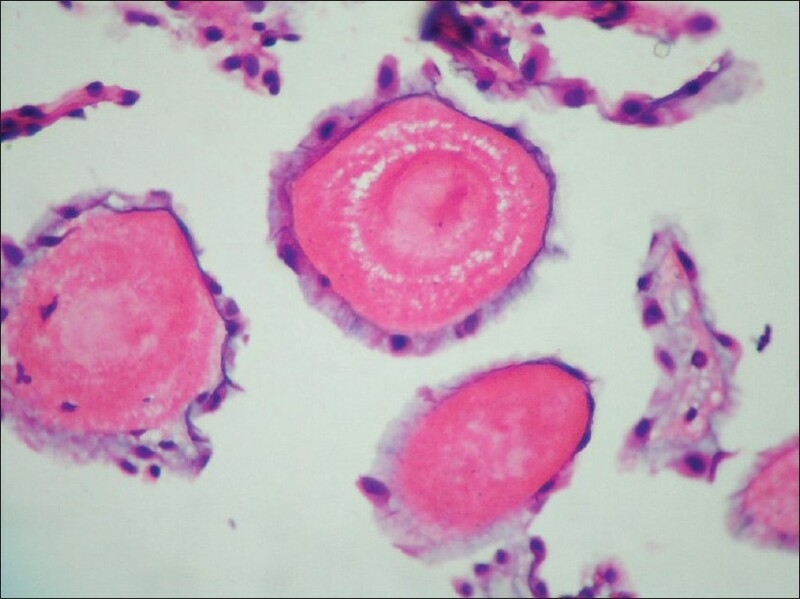 Disseminated cryptococcosis usually occurs in immunocompromised individuals with defective cell-mediated immunity, most commonly seen with HIV infection. 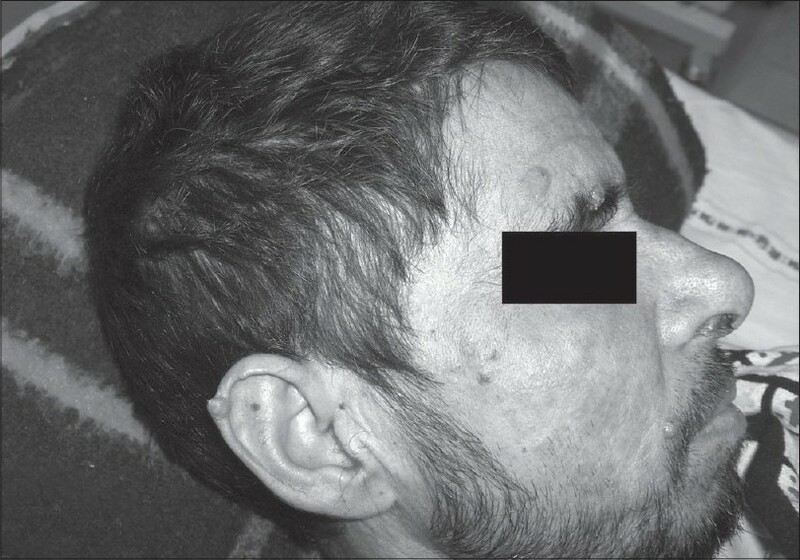 We present a case of disseminated cryptococcosis in an HIV-negative male patient who presented with headache, fever, altered sensorium of short duration and multiple cutaneous lesions. 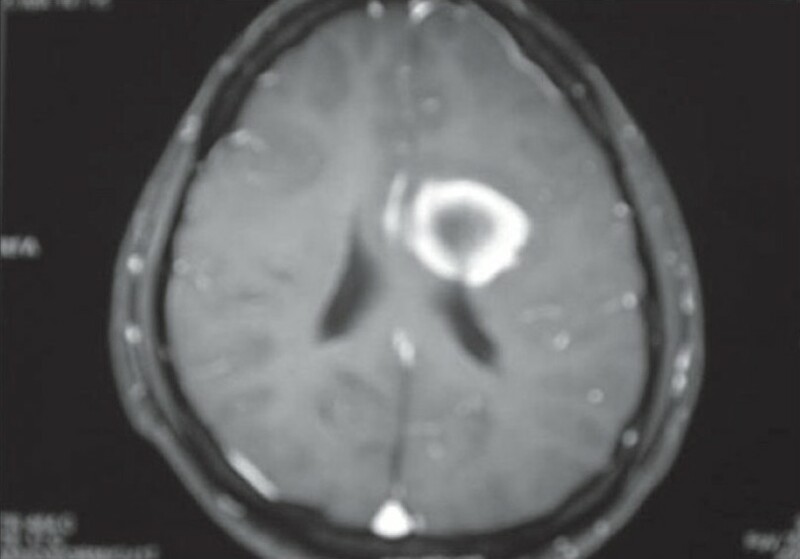 An emergency CT scan of the head showed multiple intracranial and intraventricular granulomas. Routine laboratory investigations were within the normal range. 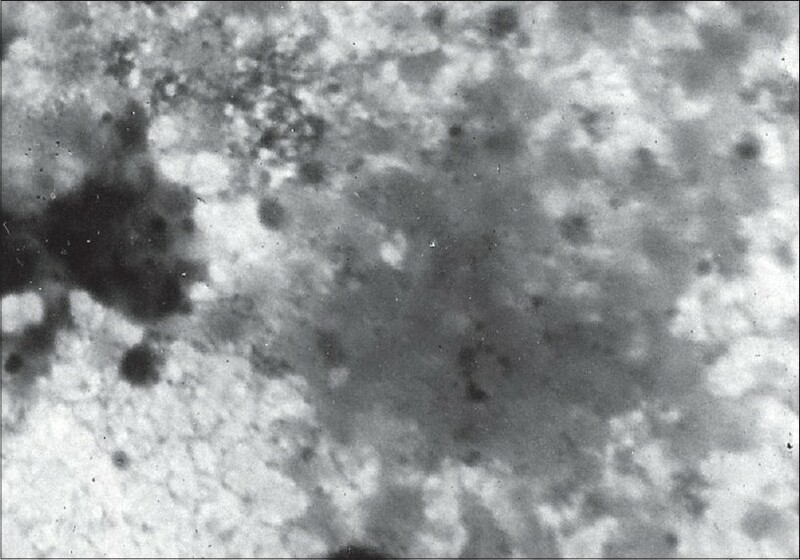 A CSF examination revealed capsulated yeasts on India ink and a culture yielded cryptococcus neoformans. A cryptococcal antigen test by latex agglutination kit was positive. 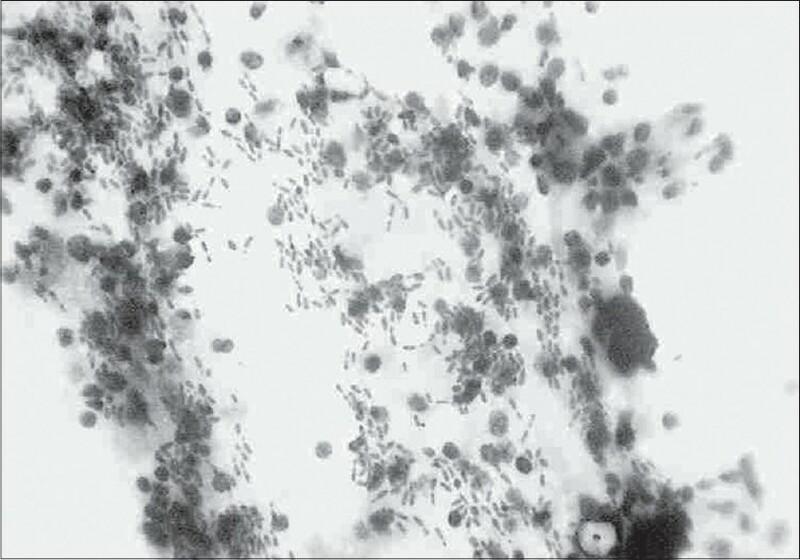 A biopsy revealed multiple capsulated yeasts cells in the cutaneous lesions, which were consistent with cryptococcus neoformans. The patient was successfully treated with Amphotericin B and Fluconazole with regression of cranial and cutaneous lesions. 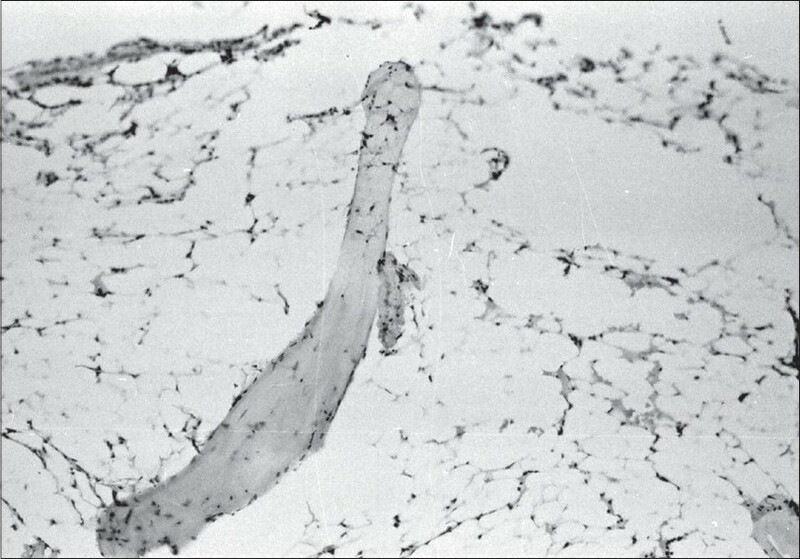 Phaeohyphomycosis, caused by heterogeneous group of phaeoid fungi causes both subcutaneous and systemic infections. 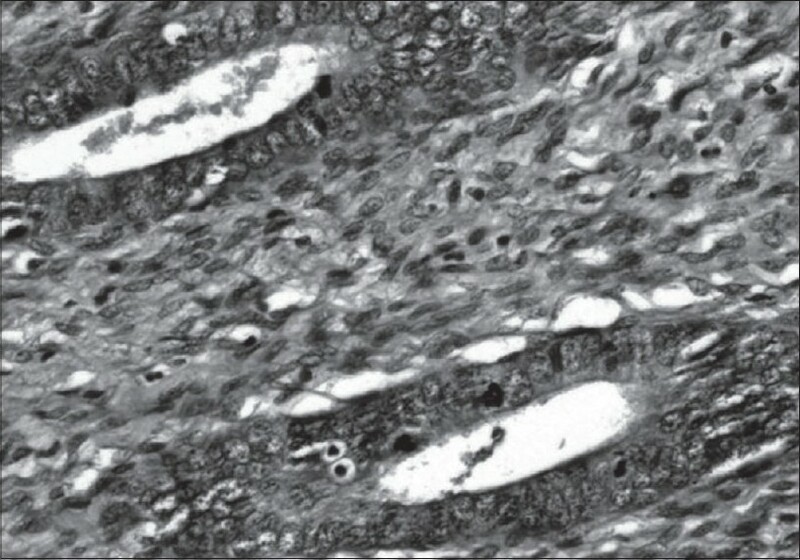 The disease is more of a histopathological than a clinical entity. 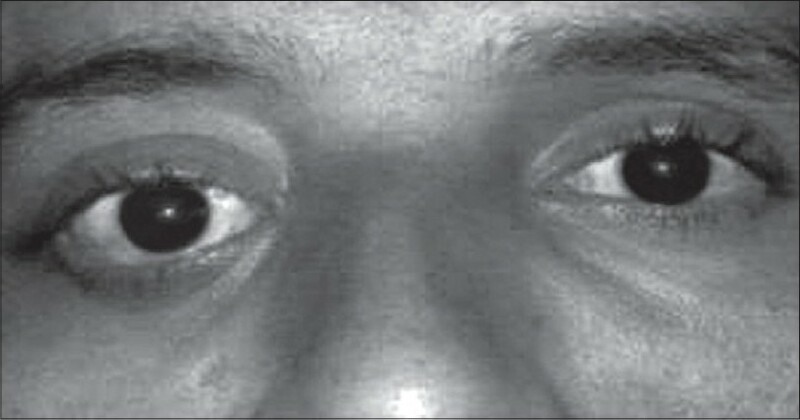 We present a case of phaeohyphomycosis in a 29-year-old male who presented with the complaint of painful swelling of the right eye of 1-year duration. Computed tomography (CT) scan showed an abnormal hyper dense enhancing soft tissue in the extra coronal aspect of the right orbit along the superolateral and superomedial aspect. A provisional clinical diagnosis of lymphoma or fungal infection was entertained. Histopathology revealed granulomas with numerous multinucleated giant cells and fungal hyphae within and in between the giant cells. Per-iodic acid Schiff (PAS stain) was used to confirm the presence of hyphae. Based on the clinical, CT and histopathological features, a diagnosis of Phaeohyphomycosis was given.